Charts that show the amount of break on a putt can be misleading. This is because they are based on a number of assumptions that you may not be aware of. How you decide on your putter aim is based on your aiming preference. Do you see a pathway and entry point to the hole, or do you pick a specific spot as your target? In deciding how your ball will behave, it is essential to find the straight putt - in other words the local fall line. Putts on the fall line are either straight uphill or straight downhill. All other putts have some break to them. Depending where your ball is situated in relation to the fall line, your putt will break either right to left or left to right. The important question is how much should you allow for the break? the direction from where you putt. Combining this information with a constant delivery speed at the hole for every putt (e.g. a premise that all missed putts will roll 17 inches past the hole) it is possible to calculate a specific target for each breaking putt at so many inches from the centre or edge of the hole. For example, for an uphill 10-foot putt from 4 o'clock on a green stimping at 8 feet with a slope of 2% (1.2 degrees), you should aim 7 inches from the edge of the hole. stroke your putt at the pace used in the calculations of the charts. no variation in the degree or direction of the slope between your ball and the hole. However, there is a presumption of accuracy that is usually not there. For example you may fail to identify the fall line or the distance (and orientation to the fall line) of your ball to the hole. Your delivery speed may also be significantly off. they have the potential to slow down a game that is already taking too long. You are now reliant on the interpretation of a series of numbers rather than a 'look and go' approach. I am not against any tool that helps you to putt better. In fact, I would encourage its use if it helps to improve your putter aim. However, I believe putting aids that offer a best-fit aimpoint for every breaking putt should be used on the practice putting green or during a practice round. With the knowledge that you gain you can then approach these types of putts in competition with greater confidence. By all means map the greens for the local fall lines and degree of slope at probably hole locations. This is useful information to have with you on the course. 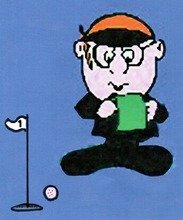 In the end I believe you should rely more on your intuitive brain than a set of preordained numbers for your putter aim. When you become caught up in analysis and the manipulation of the pace of your putt, your putting is likely to suffer.